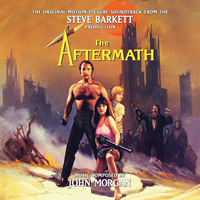 Dragon’s Domain Records, to be distributed through buysoundtrax.com, presents the world premiere soundtrack release of THE AFTERMATH, featuring music composed and conducted by John Morgan for the 1982 science fiction film written, produced and directed by Steve Barkett and also starring Lynne Marguilies, Larry Latham, and Sid Haig. THE AFTERMATH tells the story of three astronauts returning to Earth from a deep space mission only to find a world demolished by nuclear war. Crash landing just off Los Angeles, the two surviving astronauts, Newman and Matthews, find that the city is occupied by blood thirsty mutants and, worse, ruled by a gang of mercenaries under the leadership of a violent thug named Cutter, who leads his gang on raids to murder the male survivors and enslave the women and children. After exploring the wreckage of the city, Newman and Matthews rescue two women and two young children; they struggle to keep their new families alive, despite the ongoing threat of Cutter’s raids. Writer-director Steve Barkett first conceived of the film in 1972 as a project he wanted to develop with his friend Stanley Livingston (then completing a twelve-year run as Chip on the long-running 1960s TV series MY THREE SONS). “Stan and I wanted to make a movie together,” recalled Barkett. “We had the story and we wrote the first draft screenplay together. Originally in the first draft we were schoolteachers, not astronauts.” After several false starts that failed to come to financial fruition, and just as Barkett had decided to scrap the whole idea, financing came via an old family friend, International businessman Isam Jamjoom. The AFTERMATH was their first collaboration. Barkett and Jamjoom remained business partners for over 20 years in a variety of enterprises including multi-million dollar real estate projects as well as Barkett’s 1991 million dollar epic EMPIRE OF THE DARK (also scored by John Morgan). As Barkett had suggested, Morgan succeeded in crafting an expressive fusion of Herrmann and Steiner, imparting a musical voice distilled from a confluence of both: the brooding, swelling, ominous Herrmann chords frothing with the vivid melodic touches of Steiner. Despite the production’s meager budget, Barkett was able to accommodate a reasonably large orchestra to record the score. John Morgan’s score is almost an anachronism for its day, reflecting a scoring tradition of an earlier era at a time when most sci-fi films were exploring new worlds of electronic music or embodying clear-cut STAR WARS facsimiles. But Morgan’s music, expressing the stylistic trademarks of 1930’s Max Steiner and 1950’s Bernard Herrmann, gave THE AFTERMATH a potent aural production value that elevated it far above its low-budget sci-fi stigma, and provided Barkett’s post-apocalypse story with a pervasive sense of dramatic import that no other film of its type had achieved. John Morgan is a film composer based in Los Angeles, California. After receiving his Master’s Degree in Music at San Diego State University, and studying composition with David Ward-Steinman, he stayed on at the University and taught orchestration, music theory and various film music courses. In the late 70s, Morgan moved to the Los Angeles area and secured work orchestrating for such composers as Fred Steiner, Bruce Broughton and Alex North. In 1979, Morgan composed and orchestrated his first feature film score and in the ensuing years composed music for more than 30 feature films, as well as many television, radio and cable projects including STARSHIP TROOPERS 2, TRINITY AND BEYOND, RAY HARRYHAUSEN – THE EARLY YEARS, CINERAMA ADVENTURE, DEMON IN THE BOTTLE, TINY TOON ADVENTURES and others, many in collaboration with his music partner and lifelong friend, William Stromberg. Morgan's love and passion for the great scores of Hollywood's golden age has led him to the arena of arranging and reconstructing many classic scores for new recordings. He has embarked on a long series of film music recordings for Marco Polo (Naxos), BMG Classics his own label with Anna Bonn and William Stromberg, TRIBUTE FILM CLASSICS. Among the scores he has reconstructed and orchestrated for new recordings are: Max Steiner's THE CHARGE OF THE LIGHT BRIGADE, KING KONG; Erich Wolfgang Korngold's CAPTAIN BLOOD, ESCAPE ME NEVER, THE ADVENTURES OF ROBIN HOOD, THE SEA HAWK; Roy Webb's scores for the Val Lewton films, Hans Salter and Frank Skinner's THE WOLF MAN, HOUSE OF FRANKENSTEIN, ABBOTT AND COSTELLO MEET FRANKENSTEIN as well as scores by Hugo Friedhofer and Victor Young. Dragon’s Domain Records is excited to present the world premiere compact disc release of THE AFTERMATH, remastered and reconstructed from the composer’s own elements by James Nelson at Digital Outland with assistance from composer William Stromberg. The booklet includes exclusive liner notes written by author Randall Larson, with the participation of the film’s director and star, Steve Barkett, along with composer John Morgan and a final word from composer William T. Stromberg. THE AFTERMATH is a limited edition release of 1000 units.